CarGurus has 22,693 nationwide Challenger listings starting at $5,995. 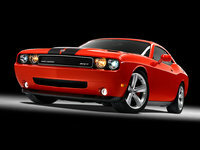 For those into muscle-flexing American retro, Dodge once again offers its Challenger midsize coupe for 2014. This classic 2-door seats 5 and flaunts 16.2 cubic feet of cargo space while remaining available with the choice of a V6 powerplant or two Hemi V8 engines. And once again, it also comes with the traditional confusing array of optional trims and packages. Essentially available in four variations, the base SXT, the midlevel R/T, the muscle-bound SRT8 Core and the flagship SRT8, various available feature add-ons will turn the SXT into the SXT Plus and the R/T into the R/T Plus, the R/T Blacktop and the R/T Classic. Meanwhile, in appearance and creature comforts, the 2014 edition of Dodge’s iconic Challenger is expected to pretty much mirror the 2013 offering. All trims also remain offered only in a torque-toting rear-wheel-drive configuration, with the Challenger lineup differing from its Charger stablemates in not offering an all-wheel-drive version. Again, the variable-valve-timed (VVT) 3.6-liter V6 engine is slated to power the base SXT trims, with the standard 5-speed shiftable (Autostick) automatic transmission allowing 305 hp and 268 lb-ft of torque. Mileage is once again expected to be in the range of 18 mpg city/27 highway. The 2014 Challenger R/T and its various spawn will likely remain packing the potent 5.7-liter Hemi V8 that puts out 375 hp and 410 lb-ft of torque when mated with the standard 6-speed manual transmission. The 5-speed shiftable automatic, meanwhile, is available to this midlevel trim and boasts steering-wheel-mounted paddle shifters. Be advised, however, that in the case of the V8-toting R/T, the 5-speed automatic cuts performance numbers to 372 hp and 400 lb/ft of torque. Mileage, therefore, reflects the transmission pairing in that the stick shift is estimated at 15/23 and the automatic at a somewhat remarkable 16/25. Once more, cylinder shutdown at highway speeds helps the automatic-equipped trims achieve these surprisingly impressive mileage figures. The standard 6-speed manual transmission also equips the SRT8 Core and its up-featured SRT8 sibling, but it’s matched up with the smoking-hot VVT 6.4-liter Hemi V8 for 470 hp and 470 lb/ft of torque. Again, these chiseled trims can be equipped with the 5-speed shiftable automatic but without the fuel-saving engine shutdown feature, thus performance numbers remain the same with either shifter, and mileage is pegged at 14/23 with either transmission. Standard features in the entry-level 2014 Challenger SXT are likely to again include 18-inch alloy wheels and power-adjustable mirrors outside, with cloth upholstery, a power-adjustable driver’s seat, remote power door locks and power windows adorning the inside. Cruise control and telescoping tilt-wheel steering are expected to return, as are the leather-trimmed steering wheel and shift knob, climate control and floor mats in front and rear. Entertainment is under the auspices of the basic Uconnect 130 audio interface and boasts a single-CD player with 6 speakers, as well as an auxiliary MP3 input. The Hemi-hauling R/T, in its most elementary form, adds a tweaked suspension and steering (thus justifying the Road/Track designation), as well as a rear spoiler, upgraded audio components with satellite radio and an auto-dimming rear-view mirror. The up-powered SRT8 Core, meantime, throws in 20-inch alloy wheels and premium cloth upholstery, with the top-shelf SRT8 sporting standard leather-trimmed upholstery, heated front seats, heated power-adjustable outside mirrors, a remote garage door opener, rear parking sensors, Bluetooth hands-free communications, and upgraded leather and simulated alloy cabin accents. Options-wise, the base SXT can be upgraded to the SXT Plus and Redline Rallye sub-trims with the addition of leather-trimmed upholstery and heated front seats, an auto-dimming rear-view mirror, upgraded 276-watt audio with a USB port, rear parking sensors, sport-tuned suspension and steering components, up-sized brakes and unique graphics and decals. The R/T, meantime, can be boosted to the R/T Plus, R/T Blacktop and R/T Classic sub-trims with further upgrades to the performance suspension and steering systems, as well as some add-ons that come standard in the SRT8. A power sunroof, as well as a premium Harman Kardon stereo with 18 speakers and Surround Sound technology, are all trim-dependent available extras, as are upgraded Uconnect 730N infotainment with GPS-based navigation and upgraded wheels with performance tires. Safety-wise, look for 2014 Challengers to be delivered with standard 4-wheel antilock brakes (ABS), traction and stability control, front and rear head airbags, front side-mounted airbags and front head restraint whiplash protection. A post-collision safety system also comes with every trim, while the R/T and SRT8 sport standard front fog/driving lights and daytime running lights that are optional with the SXT. Finally, the SRT8 additionally flaunts a standard remote antitheft alarm and xenon high-intensity-discharge (HID) headlights. 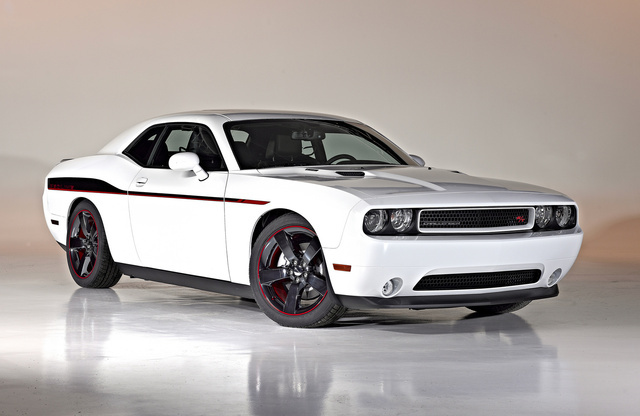 What's your take on the 2014 Dodge Challenger? TheHorror Shave your mustache, Tallberg. It's shamelessly terrible. 1mangang Test drove car loved it. Users ranked 2014 Dodge Challenger against other cars which they drove/owned. Each ranking was based on 9 categories. Here is the summary of top rankings. 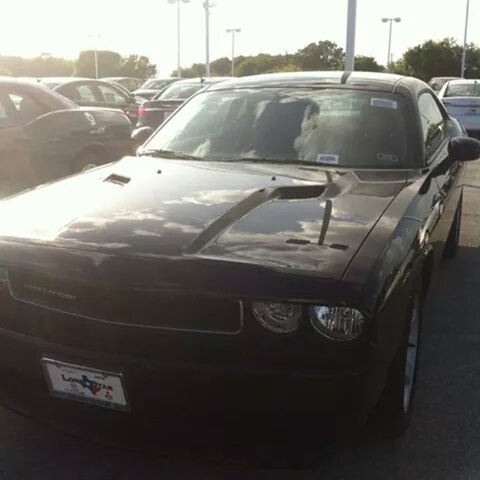 Have you driven a 2014 Dodge Challenger? Car is over heating, I replaced the coolant, the cooling fan the radiator and the thermostat, but now is over heating even faster.